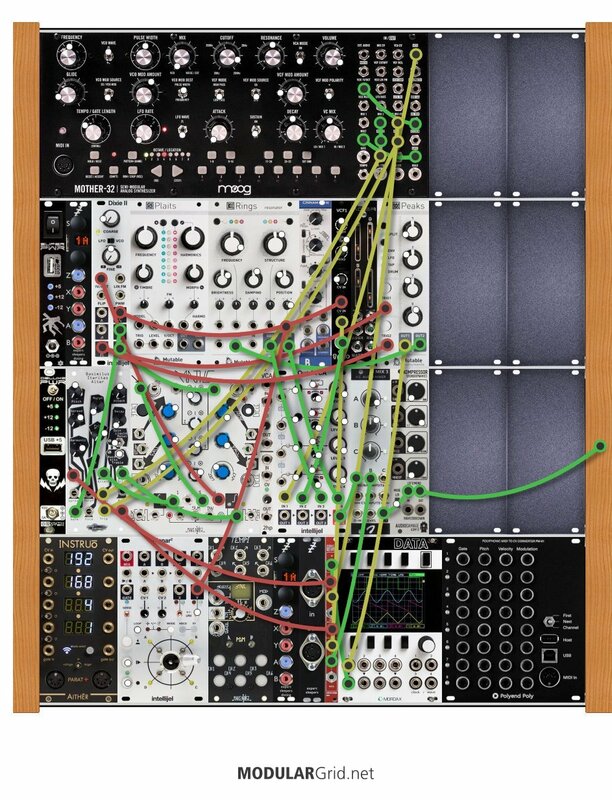 - A mostly low register 8-step sequence from Mother 32 modulates its' own pitches by musical intervals usually greater than or equal to one octave thanks to Gate being fed into VC Mix Attenuator and into 1v/oct input. - This voice then triggers the BIA which exists in the Alto register. Rings and various modulations on the M32 and BIA are triggered and otherwise influenced by a 4-step CV sequence coming from Peaks' Channels 1 and 2 outputs (same sequence, "Twin" mode). a fast and spastic up and down motion with the joystick to create an aggressive phasing effect when sent to Position on Rings, sometimes it is Looped and other times it is used as a one-shot.